How should policy-makers design incentives for innovation that’s inclusive? This column explains that first, they need to be clear on what they are trying to achieve: bringing innovative products and services to people; or bringing people into the process of innovation. Once the intent is clear, there is a menu of potential policies, including funding, tax incentives, regulatory changes, using public procurement, supporting clusters, accelerators and institutes, promoting stock market development, as well as education and training. In the wake of the global financial crisis, as economic growth rates stalled, policy-makers turned to promoting innovation with particular fervor in the hope of restoring prosperity, job creation and national competitiveness. At the same time, as concerns about technological innovation causing environmental harm and generating greater social inequality continue to grow, policy-makers have increasingly thought of innovation as something that does more than Schumpeter’s process of “creative destruction” or pushing forward the technological frontier. With the Sustainable Development Goals and widespread public anger over rising inequality, notions of “sustainable innovation” and “inclusive innovation” have moved centre stage. So how can we promote innovation that’s inclusive? First, it is essential to be precise about the aim, especially since there are two distinct conceptualizations of "inclusive innovation”. One is focused on innovation as a product or service that can address issues of social inclusiveness; the other is focused on including people, places and industries in innovation processes and activities. In other words, inclusive innovation is either about innovative products or services that benefit members of society (and often development in a spatial context) or it is about bringing people into the process of innovating. Diversity – referring to people with different characteristics collaborating, often in the workplace – is promoted through inclusion processes. Inclusion is about people’s perceptions that they are included, not only about the existence of individuals with distinct characteristics. In this context, policies to promote inclusion in innovation activities target increased participation and substantive integration with underrepresented groups. Targeted policies encourage women, minorities, and people with disabilities to participate in innovative activities through competitions, by extending tax incentives, education and training, and grant schemes. The other understanding of inclusive innovation, often invoked in developing country contexts, such as some World Bank projects in Vietnam, focuses on innovation as the product as a means of including marginalized groups and driving development and inclusive growth. Here, inclusive innovation refers to the potential for technological innovations to reach particular social groups (or regions) to benefit from innovations. Policy efforts can take the form of technology-promoting initiatives, such as funding for technologies that address social issues (for example, to improve agricultural productivity, to alleviate loneliness for ageing demographics, and so on). In this version of operationalizing inclusive innovation into policy action, policy-makers design competitions, grants, tax incentives and more to target the solution of a social challenge often faced by a particular group. To return to the motivating question: how should policy-makers design incentives for innovation that’s inclusive? 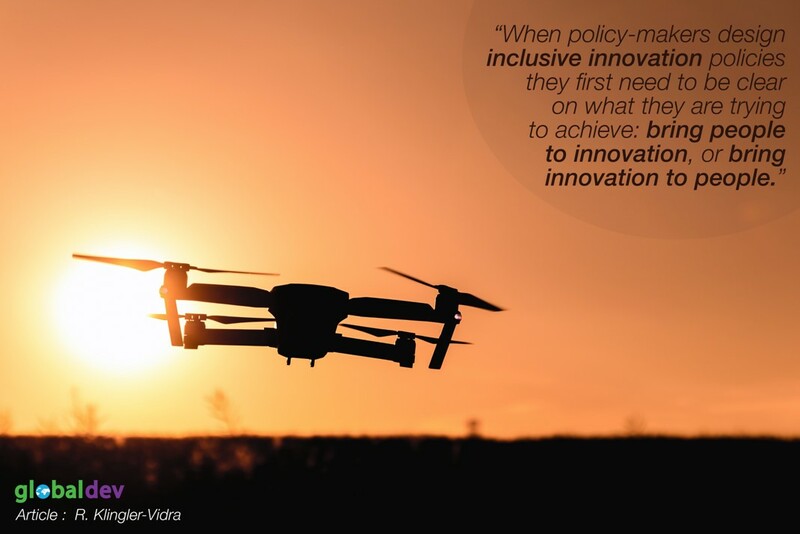 When policy-makers design inclusive innovation policies they first need to be clear on what they are trying to achieve: bring people to innovation, or bring innovation to people (or problems). Once they establish the aim, then their means of targeting could focus on participant characteristics, in which key performance indicators (KPIs) reflect their aims of increasing activities among selected demographic groups. Alternatively, policies target would-be entrepreneurs’ ability to use technological innovation to improve a social challenge, in which case KPIs focus on performance in alleviating the problem. Once the aims are clearly distilled – and the KPIs and timeline determined – inclusive innovation policy-making then turns to identifying which policy instrument to leverage. There is a veritable “menu” of policies, including funding, tax incentives, regulatory changes, using public procurement, supporting clusters, accelerators and institutes, promoting stock market development, as well as education and training. A combination of policies with short and long time horizons can build initial momentum and then foster deeper processes of social change. Collectively, the two types of inclusive innovation policies can increase participation in innovation processes and harness the potential of technological innovation to address the challenge of social inclusion. But the key is first to be clear on intent instead of trying to achieve both aims at once.